Premier has come out... and boy is it an expensive product!!! But as is Upper Deck's tradition, the later the product in the collecting season, the more expensive it is (well, except for Portfolio I guess). One box/pack of Premier will set you back over $300. Wow. There better be some awesome stuff in this product for UD to be asking for that price!!! The Upper Deck Premier base cards come on premium thick card stock and are serial numbered to 399. They sport a very modern design with a relatively minimalistic feel. Most of the glitz on the card comes on the left hand side where there is silver foiling. Though the cards are nice and clean, there really isn't anything that makes these base stand out. They're sort of the typical high-end card without a lot of drama. For collectors who prefer a simpler approach, these cards might be exactly the base you want. I, on the other hand, would love something more dramatic. Interestingly, the card backs have a horizontal orientation. Having it this way makes the cards a bit more interesting. The graphics used on the back aren't typical of what you would find on a card back - they actually have a livelier feel to them. The colors are bright and bold and there is actually a little bit of written text to accompany the statistics - that's pretty uncommon for high-end! These card backs are surprisingly well done and I applaud the effort UD has done on them. 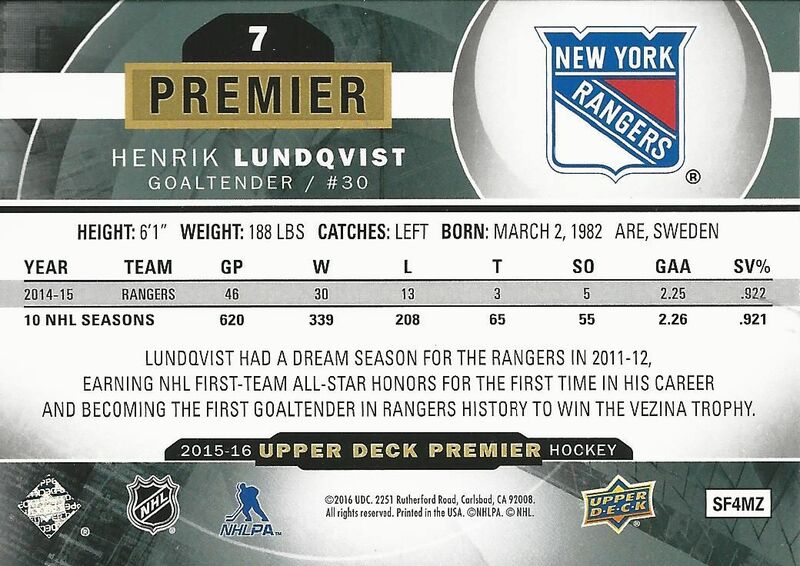 There are two types of of rookie cards in the main set of Premier. The first set is a simple design that has a similar feel to the base set except that the cards feature an autograph. The second are the rookie patch autographs done with an acetate feel. The acetate rookie cards are the ones that collectors will take most notice of. They come one per box and are numbered to 375 (or 199 for the star rookies). The acetate rookie cards look great. They have a sweet and slick shimmer to them that is quite unique. These rookie cards make a nice addition to the main set and build upon the look of the standard base card. Being a super-premium product, Premier comes in a really great looking tin. These tins may be collectible themselves in the future if Connor McDavid pans out the way many think he will. Inside the tin is an abundance of hits. There better be as the price of Premier is sky high! 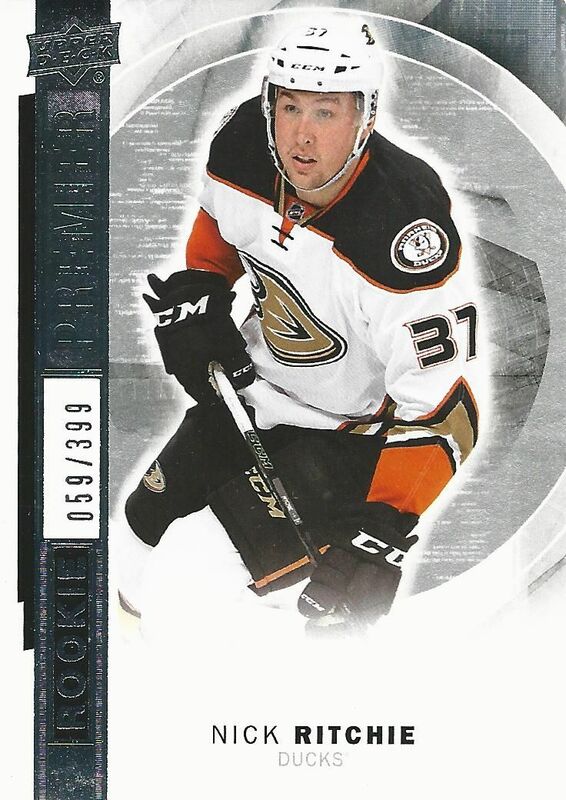 It's hard to call this 'rookie card' an insert, but it is not numbered as part of the main set. These cards are numbered to 399 (or 299 for star rookies) and look just like the standard base cards. 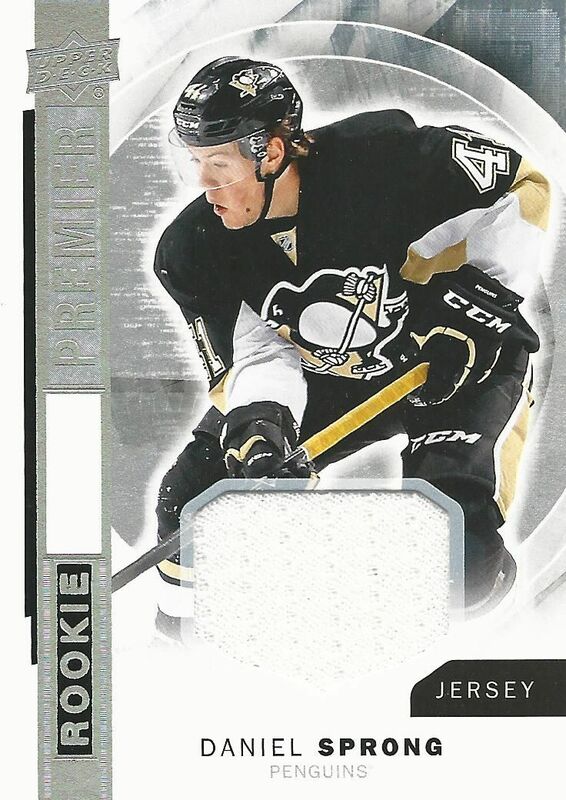 I thought these were the regular rookie cards of the Premier set, but upon inspecting the back, they aren't. Each card in this set has an 'R' designation next to the number. I'm not sure why these cards were included in the set, in my opinion they could have easily been left out. In almost a parallel to the rookie set above are the rookie jersey cards. These, interestingly, aren't numbered. There is a box where a serial number could be placed, but there is nothing there. The regular set has an event used jersey piece. Higher level versions exist and have better materials in them. 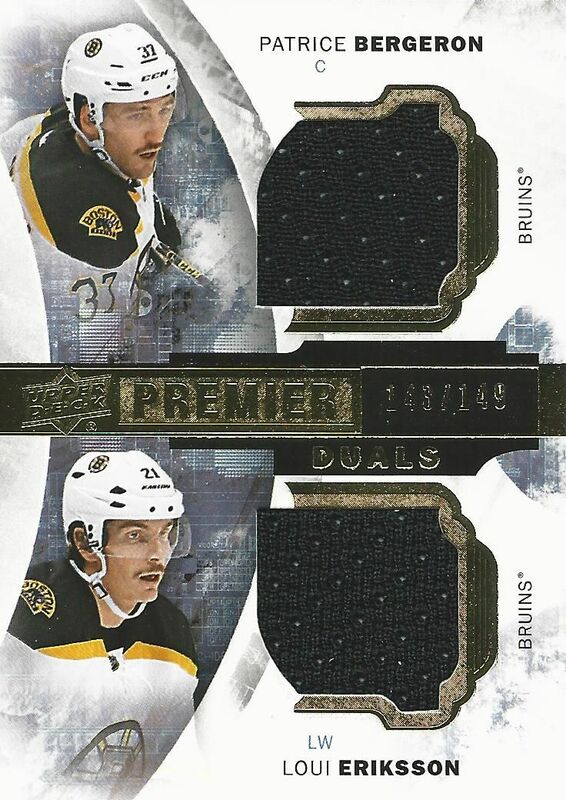 This Premier Swatches jersey card is similar to the rookie jersey cards but with one big difference. The jersey piece inside has come from an actual game rather than event such as a photoshoot. That makes a big difference to many collectors. It's really great to know that the memorabilia inside the card came from a game. In terms of market pricing though, there probably won't be a significant difference. Here's a dual jersey card that I pulled. 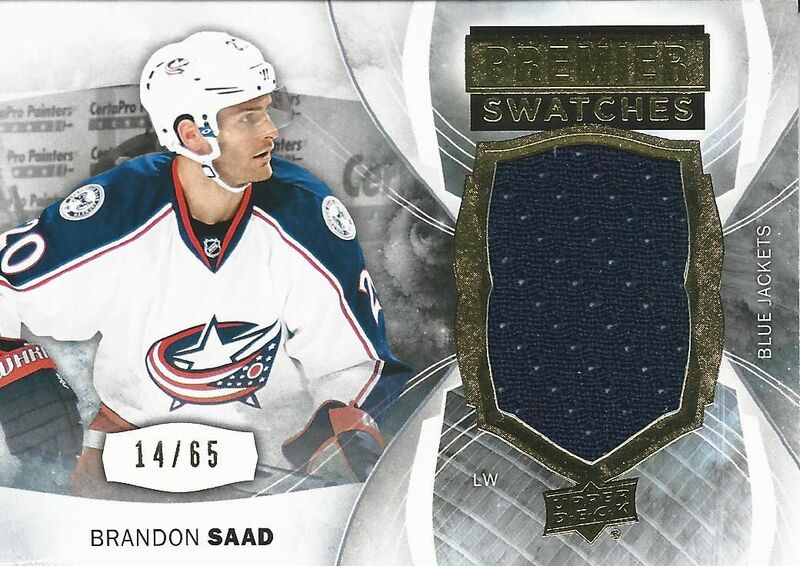 Like the Brandon Saad swatch, both of these have been guaranteed by Upper Deck to have come from a game. This particular dual jersey card is numbered to 149. As you probably have guessed, there are patch variations of these cards available for collectors to find as well. My huge pull from the box was my first Connor McDavid autographed card. It's from a Tribute rookie card set and features an on-card autograph along with an event-worn patch. It's a sweet looking card, and I love it even more because it has an interesting retro design to it. This card paid for the box and then some! It's this kind of card that you hope to get when purchasing products like Premier. There are many more types of cards to find in UD Premier. Collectors will find heaps of autographs and memorabilia cards in their boxes. Some of the nicest cards have to be the Mega Patches. Those cards feature giant patch cards that can fill up almost the entire card surface. Certainly I am loving my personal break of Premier because of the McDavid, but keep in mind that most boxes of Premier aren't going to yield a huge hitter like that. I was definitely bracing myself to get value far less than what I had paid - just like my Ultimate Collection break a few weeks back. Luckily I hit a big card... and of course that's one of the reasons we collect... because every so often we can hit gold! 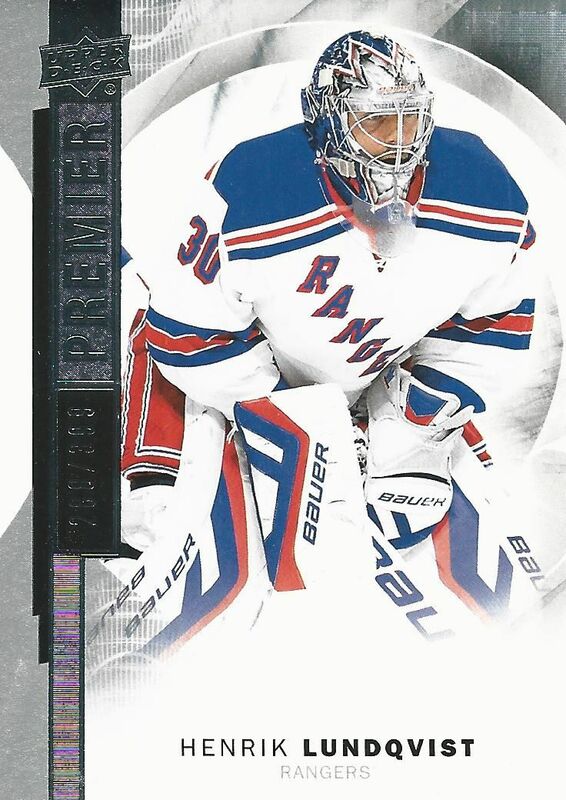 Premier is probably the second most expensive product Upper Deck has for collectors this year. At over $300 a tin it is well out of most collectors budget. If you can afford it, sure, go for it! The thrill of opening up a tin of Premier is pretty great. But like with most super-high-end products, my recommendation is to wait for singles to hit eBay and get them there for some reasonable prices. Sure, you won't get the McDavid card... or the Gretzky... but you can probably pick up some reasonable deals on good players. I think the cards look good. Also wow that McDavid card is a beaut!!! Nice pull! Really expensive product, but I think your paying for premium cards! I really love the look of the cards this year!! Would love to have that Daniel Sprong card haha AMAZING MCDAVID PULL congrats!!! Overall I like the look of the cards but man did you get lucky!!!! What a pull, congratulations man! Great review, what an amazing mcdavid card that was a specracular patch on it. Very lucky! Great product! You definitely got lucky with that McDavid. 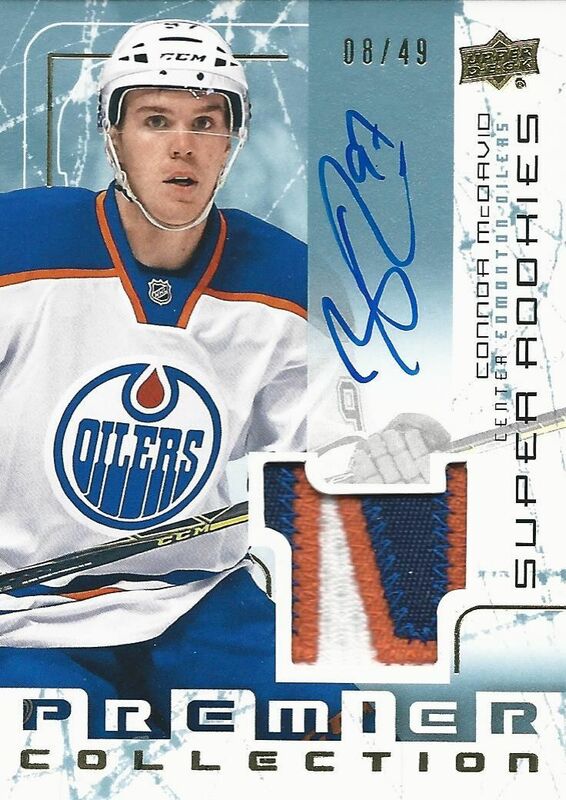 Even though you got that pull I still think that the product is a bit of a hit or miss (judging by some other breaks I've seen of this...) But still... SWEET MCDAVID!!! Wow!Sweet McDavid pull. This product looks really good. Very Nice! Super Sick pull!!! Gonna save my lunch money lol. Great review as always!! And WOW that McDavid is just an absolutely amazing hit! Glad you got one this season! Your reaction to pulling it was priceless. Can't wait for The Cup! I Really liked that tin but liked you said it is pricey but in the end it was worth the mcdavid , the base cards were nicer than the cup in my opinon but they were numbered not as high as the cup and the cards were not as thick. The product I'm not a huge fan of but damn that McDavid. You seem to get lucky on hobby box breaks! Very sweet pull! Wow But I wonder what your reaction would've been if there was no McDavid. The price is crazy! Enjoy your lottery pull! The card look nice but it's very expensive and as always nice review. And the Connor McDavid hits is amazing. That Connor McJesus card is absolutely incredible!! I would treasure something like that for forever! Great run but way way out of my price range maybe someday! Finally Blacksheep you pulled a McDavid card! Congrats! And I did realise since you got the McDavid all the other cards are not that great. Wow.. Simply just wow haha. I love this series. Cards look amazing.. All of them. Super hella expensive.. But that's the gamble.. And you just doubled your money. Omg best pull you have had by far!! holy that was an amazing pull!! Damn! That McDavid is sick!!! Great review on the high-risk, high-reward product! Boom. You got a gem there! That McDavid is just the sickest card I've seen pulled in awhile! Nice break! The cards are sick looking! Cards look nice and as we saw with your break, one can get his money back! My LCS opened a box and got the same McDavid as you! They are selling it for 2000$ CAD. Nice break and nice to see you get such a card! Congrats on the McDavid pull! Know you have been chasing one in your breaks for a while now and it's awesome to see you finally do it! McDavid pull was definitely worth the money. + Of course there are a couple of sick hits in this product. - Too many jerseys and too few big name autos per box, compared to its surreal price tag. 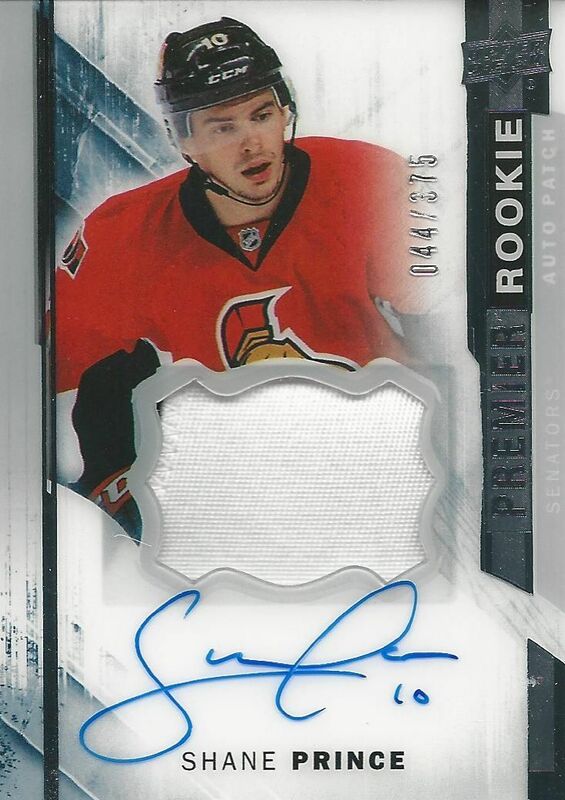 - Once again: why are two different rookie patch auto sets in the same product necessary? Not worth 300 dollars but a good break nonetheless!